I'm looking for storage solutions for my dice and cards, and came across this box. Does anyone know how many dice master dice can fit in the bottom section? I have tried to see from pictures online but they all should D20's and such. I cannot say for sure, but there are two possible ways, first it can hold 2 dice stacked together with a maximum of 40 dice or only 20 dice because the D20 is not high as two dice together. try to measure the cards high and the difference with the D6 dice in this picture here. I can say for 100% that this case holds 40 dice but is also with ~22$ the double of the price of a satin tower. You talking about this one? I've got one and I've not used it for Dice Masters recently but I think I got 100 to 120 dice into the bottom. Pretty spiffy looking actually. I might try one of these after the holidays. I stopped using mine because I got tired of having to dump out all the dice to get to ones on the bottom. That one looks cool, but I was actually looking at the other one. Although 100-120 dice in the bottom of the other one is pretty sweet! Not to just avoid your question about that specific deck box, but have you checked out ZenBins? They're made specifically for Dice Masters. I've been looking at those too. I'm trying to narrow down my options. I'm also looking at the collector boxes! If you're interested in my contribution, here's my 2 cents. I have Zen Bins and collector's boxes both. 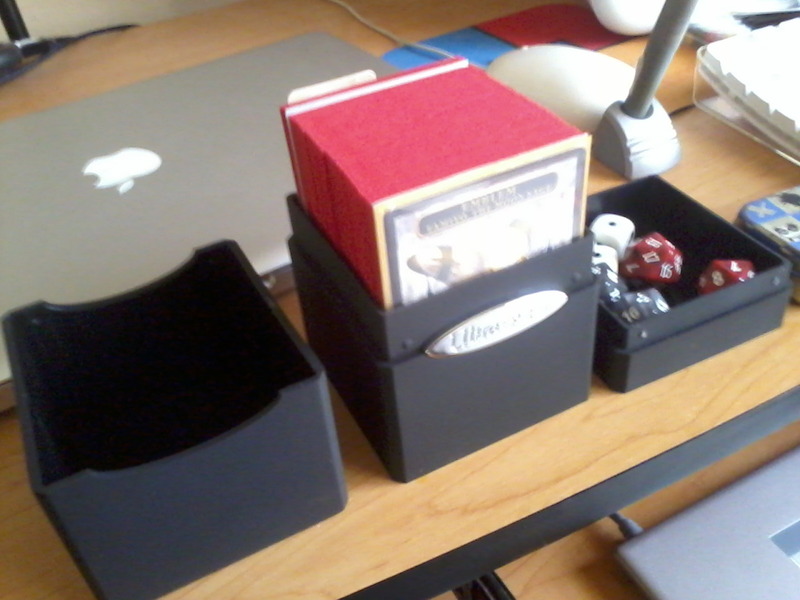 The collector boxes are nice for storing a set's worth of dice, so that I know I have a playset. I use the Zen Bins to take teams to the card shop, but I wouldn't want to store anything in them long term. Thanks for your opinion. So, what do you use for long term storage? They are testing a lot of Deckboxes and Pagebinders etc... ! My advice for Long Term is for Dice build your own(its cheap but needs some time and tools) or use something like a plastic box that is double sided. I got one box for 4€ ~ 4,5$ where i can store(just storage nothing more) 5 sets of dicemasters at least! You also can use GMT Counter Trays. Plano Boxes work also well. Now you will ask, "where should i put trays or layers of sets" well you can use Plano-Bags, with Rolls or just to carry with your arms. Some contain 4 or even 8 plano boxes. But thats pricy sometimes. Also i use instead of zenbins the Dragonshield Plastic 2 Piece- Boxes. Contain at least 3 full teams for you. Longterm, I keep a full playset of the dice for each set in the collector's box for that set, and a sleeved copy of a card from each set in a binder. Duplicates (dice and cards) are kept, sorted by set, in one of those white BCW card boxes. I pull dice and cards out for teams when I need them, and put them back when I don't. Does the binder fit under the trays? If so that would be an awesome storage solution.